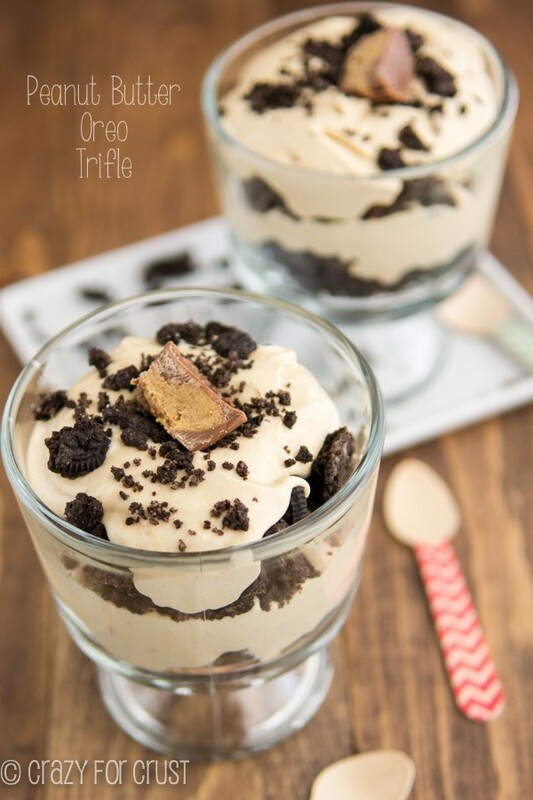 Peanut Butter Oreo Trifle – These trifles have everything I love in them. It’s perfection in a glass! You guys. 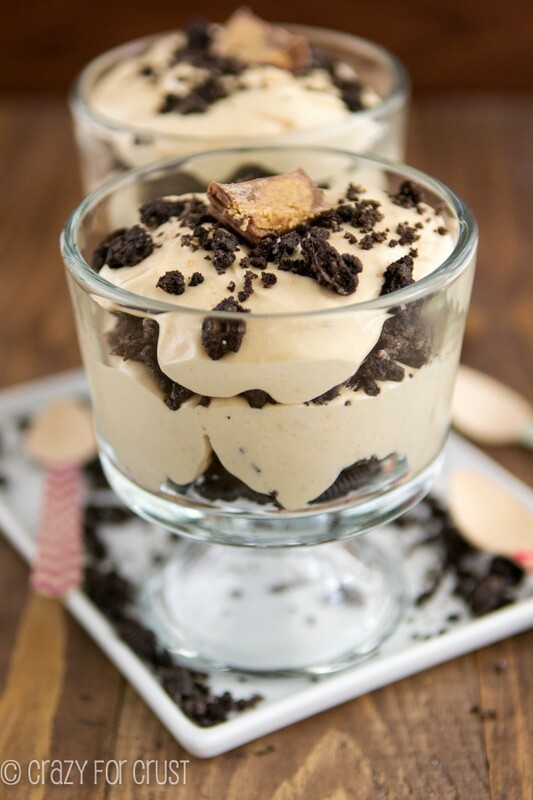 I am so in love with this Peanut Butter Oreo Trifle recipe. And I know you will be too! I absolutely love individual serving desserts. Mini pies, mini cheesecakes, pies in jars; there’s just something cool about having your own dessert. Plus, they’re great for parties. This Peanut Butter Oreo Trifle dessert? Is no exception. It’s peanut butter mousse layered with chocolate cookie crumble. It’s rich, decadent, and probably one of the best things I’ve ever eaten. And it’s from my favorite new book! 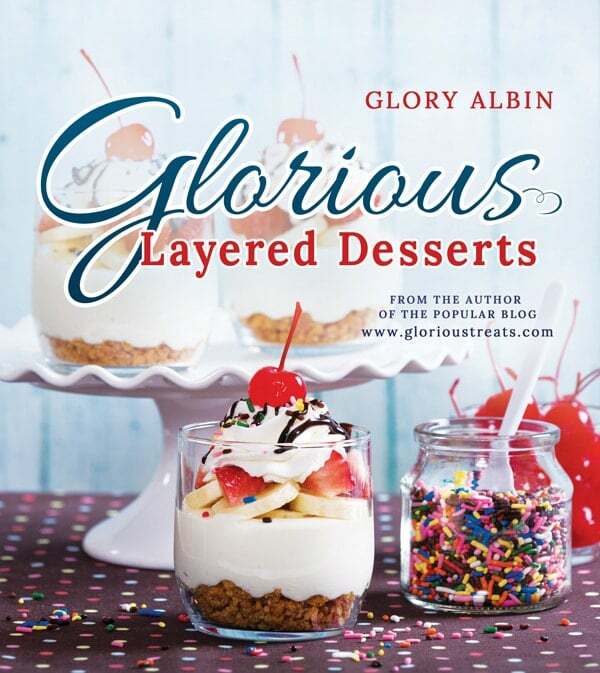 In case you didn’t know, my friend Glory Albin from Glorious Treats has written a book! It’s called Glorious Layered Desserts and it’s filled with recipes for individually sized layered desserts. Jordan stole my copy soon after I got it and marked tons of pages. Are you surprised the first one she demanded was the Chocolate Mint Crunch? Pssst…I’m giving away a copy of Glory’s book. Scroll down to enter! I had the Key Lime Coconut Cheesecake bookmarked until I went to Glory’s book launch party. It was there she served these Peanut Butter Oreo Trifles and, of course, it was love at first bite. You have no idea how good this Peanut Butter Oreo Trifle recipe is. Seriously, this Peanut Butter Oreo Trifle recipe is the best thing ever. Peanut butter mousse is made thick and fluffy with cream cheese and whipped cream and it’s layered with chocolate cookie crumble, which is Glory’s way of making an Oreo Crust that’s all crumbly. The crumble reminded me of granola. I was tempted to pour it in a bowl with milk and eat it for breakfast. I may still do that sometime. You have to make this Peanut Butter Oreo Trifle recipe. Even if you don’t make it into a trifle. Oreo crumble granola and a bowl full of peanut butter mousse to face plant in. That’s my dream, really. Isn’t it yours? 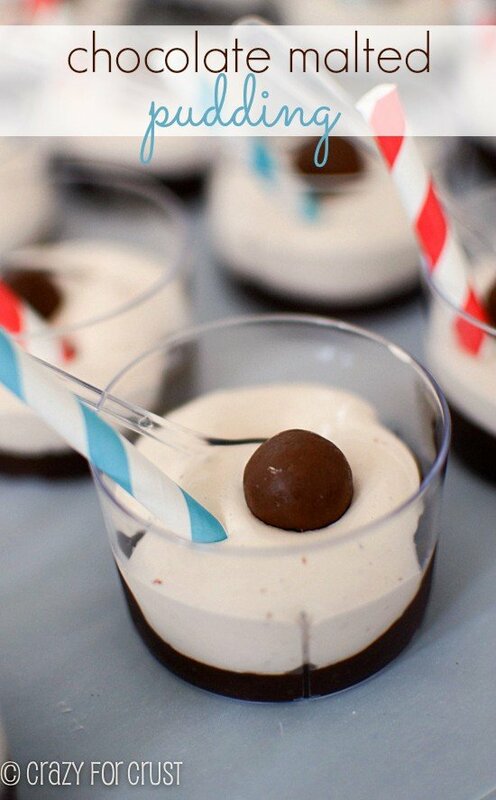 Kryptonite in a glass: peanut butter mousse layered with Oreo cookie crumble. These trifles are heaven in a bowl! Oreo Crumble: Preheat oven to 350°F. Place the cookies in a large ziploc bag and use a rolling pin to crush them. Melt butter in a medium bowl on HIGH power, then add the cookies to the melted butter. Stir until all the cookies are moistened with the butter. Bake for 10 minutes on a rimmed baking sheet. Let cool completely before making peanut butter mousse. 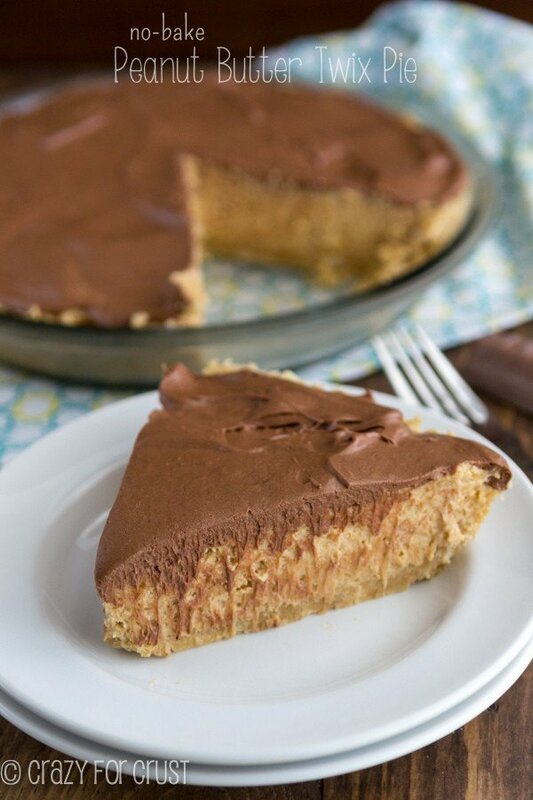 Peanut Butter Mousse: In the bowl of an electric mixer fitted with the whisk attachment (or using a hand mixer) beat heavy cream and 1/4 cup powdered sugar until stiff peaks form. Transfer to a bowl and refrigerate. Wipe out the mixer bowl (no need to wash it). Place cream cheese and peanut butter in the mixer bowl and blend with the paddle attachment until smooth. Slowly add the remaining 1 1/4 cups powdered sugar. Add the milk and vanilla. Fold in the whipped cream. Assemble the Trifles: Place 1-2 tablespoons of crumble in the bottom of your serving dishes, deepening on the size of the dish. Spoon a layer of the peanut butter mousse over the crumble. Repeat with remaining crumble and mousse. Top with half of a peanut butter cup for garnish. Note: these are very rich. Consider using small serving dishes or 2 ounce shot glasses instead of bowls. Tip: substitute Cool Whip (regular, lite, or fat-free) for the heavy cream (skip whipping the cream and fold in the Cool whip instead). I love dirt cake, but with the gummy worms…..and well my munchkins do too! Thank you for the chance! Blessings. I love strawberry shortcake! That counts, right? Yum! It looks so delish, and i’m such a sucker for peanut butter and chocolate. I can’t wait to try this out. I adore bars that have multiple layers. Like a brownie cookie dough combination. 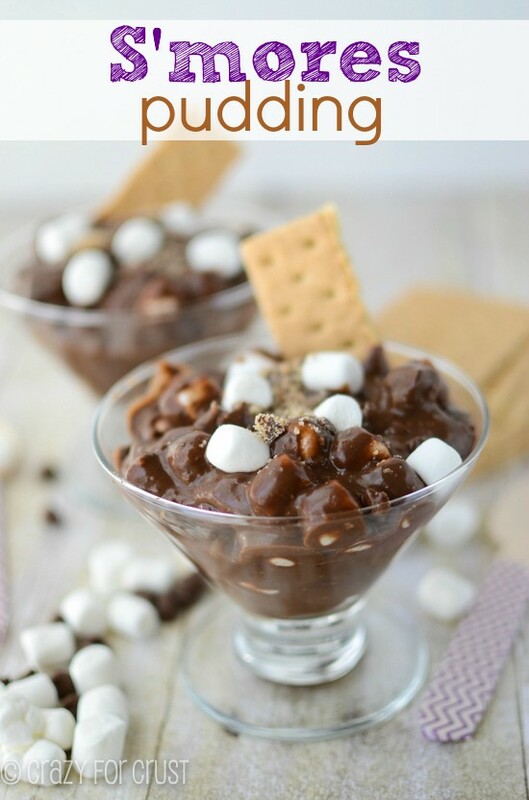 Although I must say this mousse treat looks fabulous! I love trifles – this looks SOOO amazing!! can you freeze this trifle?